Undoubtedly the most experimental of British national newspapers, The Guardian has done everything from launching an API for its content to having a go at opening its newslists to the public. N0tice is another innovative project that it is trialling, and it has real potential to take news reporting, and news gathering, in some interesting new directions. 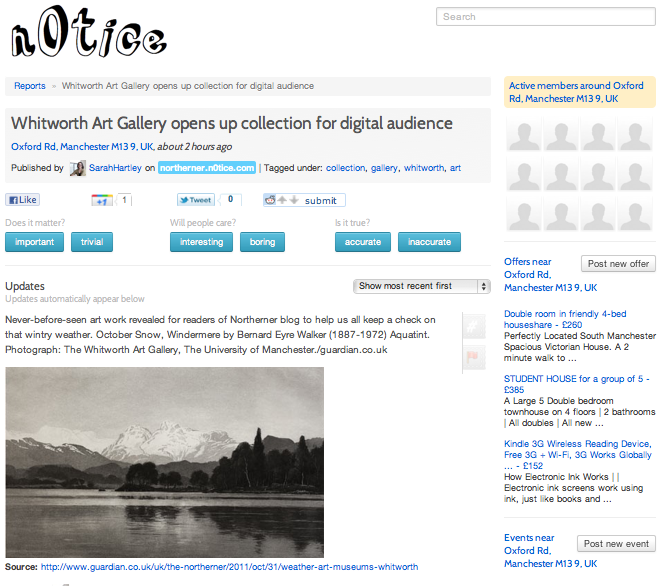 N0tice is essentially an online community noticeboard, upon which news, details of events, and local special offers can be posted for other users. Still in private beta, the service isn’t labeled as a Guardian project, taking more of the appearance of a small startup. Once it’s determined your location, the Web app displays local news, offers and events in both list and map views. In my local area at the time of writing, there are currently reports of recent crimes, flats offered for rent and a family art workshop promoted in the events section. The service is monetised via a fee for businesses that wish to advertise. New content can be added by any users. There’s a clear spam risk here, but users can vote on the importance, interest level and accuracy of each others’ postings to help bring the cream to the top. So, what’s the potential here? 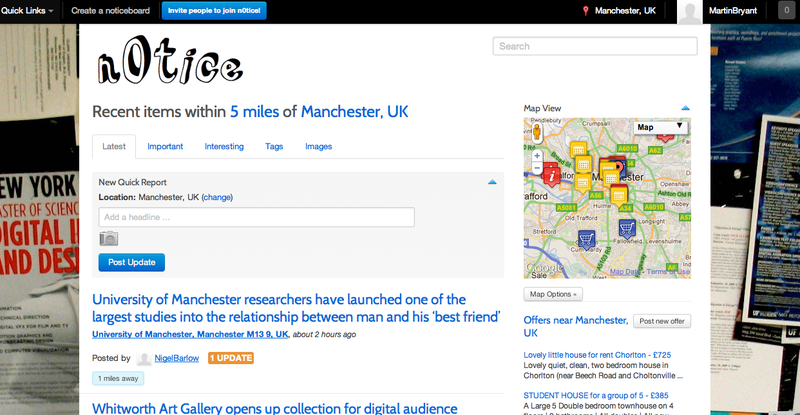 While it’s still at an early stage, and the true level of demand for the service won’t be known until it’s fully available to all, N0tice could become a truly useful way for people to share news, and for professional news organisations to source stories in locations of interest. While N0tice is being billed as a community-powered site, it’s possible to imagine the local newspaper of the future adopting a format like this, with professional journalists working alongside members of the community to maintain a one-stop shop for information about the local area. In fact, it would be great to see relevant local content from The Guardian fed into the service, although this isn’t planned at the moment. N0tice is slowly opening up to more users, so if you’d like to get on the list for an invite, you can do so at N0tice.com.